Eric Michaelson, JNF Chief Israel Officer spoke with Arutz Sheva about the JNF-KKL monument for 9/11 at the entrance to Jerusalem. He noted that the monument is the only 9/11 monument outside of the US which lists all 2,996 victims of the tragedy. “It is a symbol of solidarity - as you can see, it is in the shape of the US flag waving in the wind, and it’s a flame going to the sky, an eternal flame that won’t be extinguished. 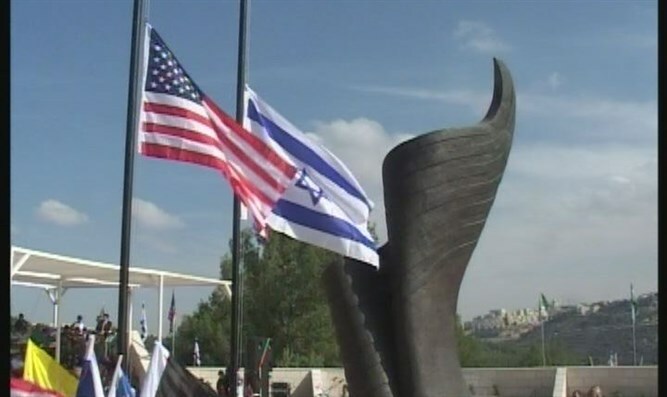 It’s a symbol of the joint destiny of the US and Israel, two nations together in brotherhood in this struggle. JNF-USA National Board of Directors member Edward Blank who funded the memorial said, "When 9/11 happened, it really was a shock to the world. Almost 3,000 people died prematurely, for no apparent reason. It was a shock, and Israel, of course, has experienced terrorism for many years. "I wanted a memorial where people could come together, understand what happened, fight, and be eternally vigilant against something like this ever happening again, and where a person could meditate on his own involvement, and reflect how to support democracy and peace everywhere," Blank said.